This might be the most unusual interspecies family we've ever seen — two cats seem to have adopted a little snail. One cat seems really zen about their snail friend, but the other one is all like "Hey little buddy, how you doing down there? Want some snuggles?" 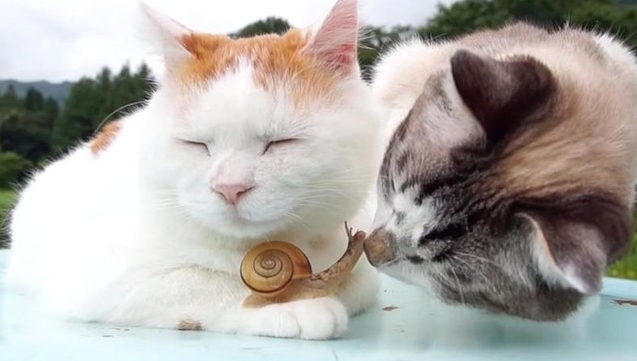 There isn't a description on this YouTube video, so it's hard to know the story behind this super cute situation, but let's pretend that these cats found a lonely snail and took him in to raise him as their own kitten, OK? Amazing Fact: Snails can have a long life. The life span for snails depends on their habitat and the species. Some of them only live for about 5 years. However, others in the wild are believed to be up to 25 years old in unusual occasions. Responses to "Cat Lovingly Nuzzles His Little Snail Friend "
I'm not too sure that second cat had honorable intentions towards the end. The snail did seem to be enjoying the company. Very cute!